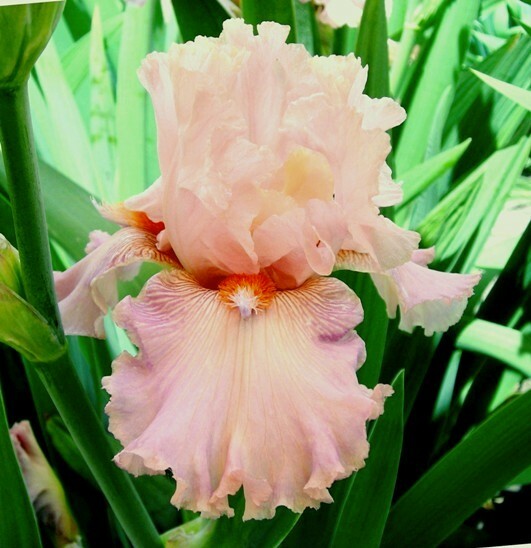 'Venus In Pink' (Leonard and Kathie Jedlicka, R. 2007) Seedling# Jeda 4-39M48. TB, 35" (89 cm), Midseason bloom. Standards medium pink; style arms light pink; falls medium pink, light purple wash and veins on haft; beards fat tangerine, consistent 1/2" light lavender horns; very ruffled, serrated edges. Seedling# Jeda 2-2A7: ('Coral Point' x Meininger seedling "White Extra") X 'Coral Pincushion'. Blue J Iris 2008.